In recruitment, we value certain performances more than others. A commanding midfield display against a bottom-of-the-table team is worth less than a similar performance against a title contender. But as long as this process is subjective – and as long as we don’t know how much each performance is actually worth in terms of how it translates to performance for our own team – there will always be a danger of overvaluing certain performances. An example of this is recruiting players who have performed well against our own club. It’s easy to be impressed by players who inflict defeats on us; not only is there the emotional reaction to losses, but we also tend to get a bigger pool of ‘scouts’ – i.e. decision makers across the club – having observed the player. It can therefore become easy to overvalue this game or games, compared to all other matches played by that same player in the season. 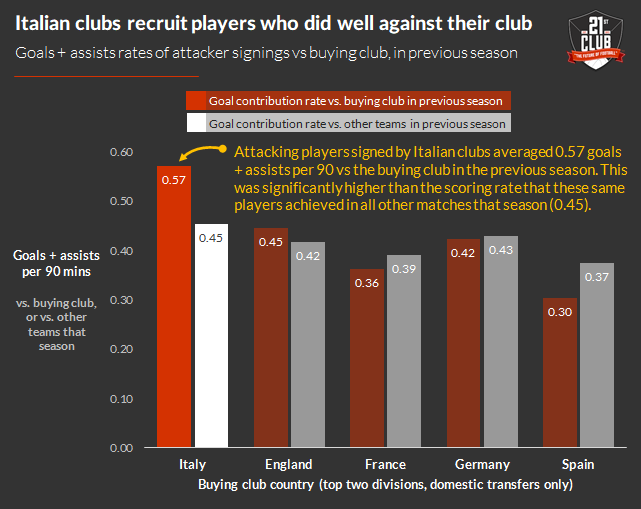 There’s evidence that this is particularly true in Italy’s Serie A and Serie B; since 2014 attacking signings have provided a disproportionate number of goals and assists against the eventual buying club, meaning the buyers potentially were unduly influenced by standout performances against their own team. This trend was not apparent in other major countries, but Italian clubs’ proneness to signing players who overperformed against their team highlights the potential for biased recruitment. There are parallels, for example, with the premium on World Cup goals; highly noticeable outputs tended to translate into higher values – but rarely better performance after purchase. When we’re faced with so many options in the transfer market, it’s easy to make the obvious choice – such as the player who played well against us. Good recruitment processes can reduce the risk of this happening – and that process should extend all the way from the scouts to the person signing the cheque.